Successfully Added 4-Port HDMI Mini Switch Box to your Shopping Cart. Simple HDMI 3x1 switch for hooking up to 3 HDMI sources into 1 HDMI device. This High Definition Multimedia Interface (HDMI) switch will allow you to connect three HDMI to devices to one HDMI TV, which is especially convenient if you only have one HDMI port on your TV but have multiple HDMI devices such as a PS3, HD Camcorder, HD cable box, etc. that you want to hook-up. Great for home theater setups or in schools or businesses where you have multiple AV devices. Packaged in a rugged casing with a manual select button and LED indicator lights for each input channel, this is probably the most easy to use switcher you have ever seen! 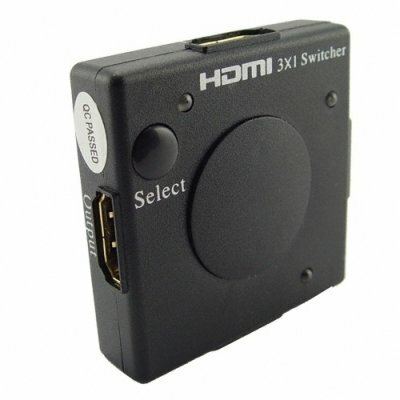 HDMI 3x1 mini switching box. Small enough to mount under cabinets, on the back of an AV rack, etc. Tidy and small unit works as you would expect.